When we left Bar Harbor, Mount Desert Island we didn’t have a solid plan (per usual). Our morning departure was delayed while waiting for an opening at the busy town dock so that we could top off our water tanks. 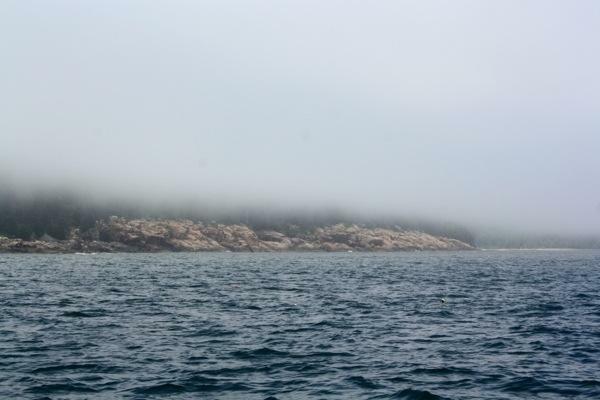 It was cold and dreary; twice fog had rolled into and out of the harbor. We did, however, need to get moving because we had social events to attend. I know, I know…cruisers don’t adhere to a schedule. But put the Communications Officer back on home turf and watch out because mini-vacations spring up everywhere! 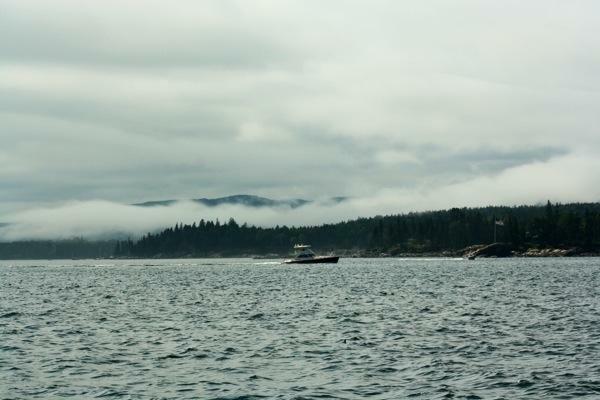 …and then gently lifting to offer us just a peek of the island as we passed along its coastline. Lobster boats, sailboats, powerboats, and skiffs continued to skirt about the water despite the wavering visibility. Brian kept a keen eye on the radar and the air horn close at hand. 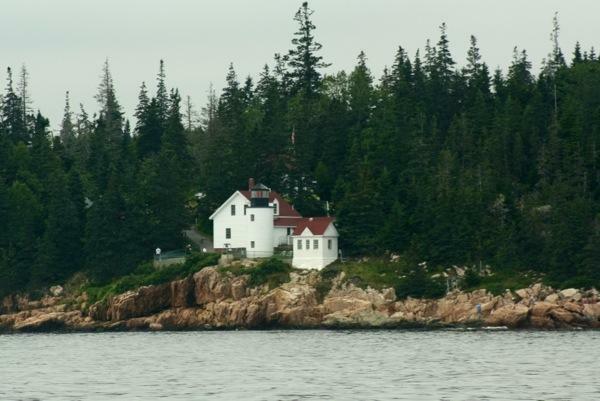 Fog break to admire the Bass Harbor Lighthouse. There was not much sailing to be had. After 24nm of motoring, we landed at Swan’s Island. 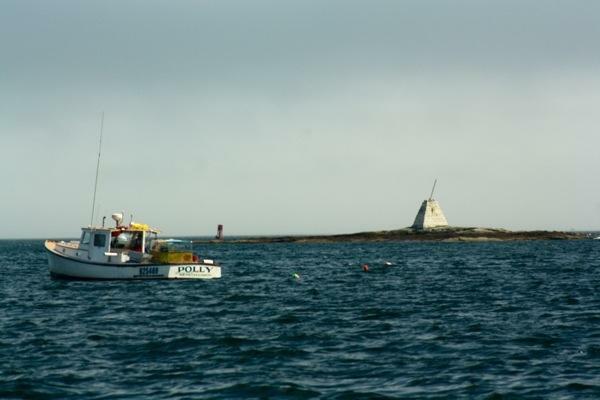 We anchored once again, as we did last year, at Mackerel Cove. This year we chose the westernmost corner of the cove and found good, mud holding in 8 feet of water. 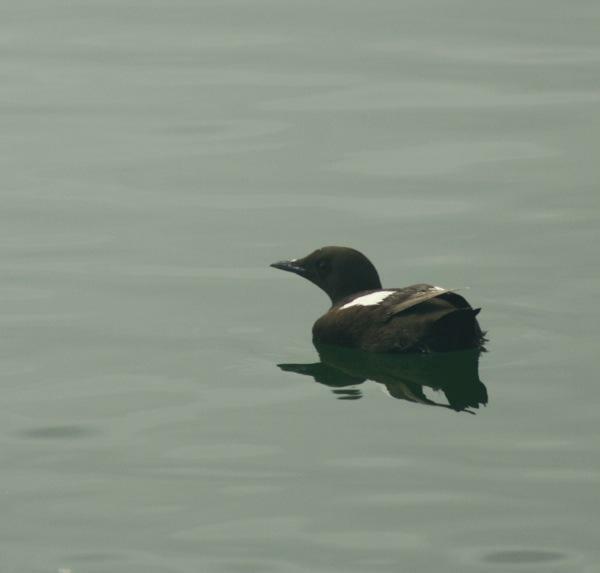 While Brian prepared dinner, I hopped into the kayak and paddled around with the local Guillemots. That evening although we didn’t have quite the showing of squid that we experienced last year…Brian did catch one! This time under the bright deck lights it took only moments before success with the squid jig. 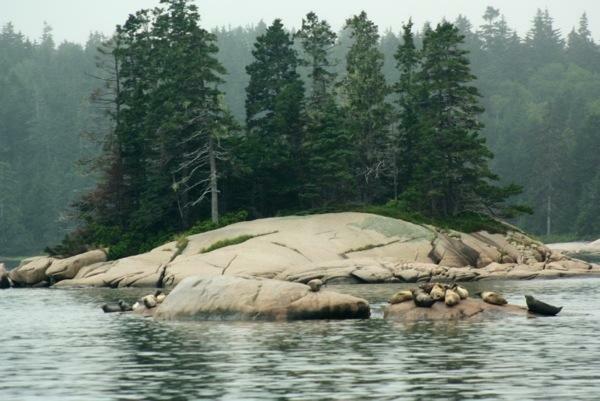 This entry was posted in Uncategorized and tagged Bar Harbor, casco passage, guillemot, mackerel cove, MDI, mount desert island, orono island, swan's island by stephanie. Bookmark the permalink.